I LOVE Macaroni and Cheese. Although not exactly “classic”, Mac and Cheese exemplifies everything I like about cooking: It’s simple and it’s delicious! This recipe requires making a roux, which seems hard, but in actuality is super simple. Based on the Martha Stewart recipe, this mac and cheese recipe is simply delicious and robust. Preheat oven to 375 degrees. Butter a 3-quart casserole dish; set aside. Place bread crumbs in medium bowl. In a small saucepan over medium heat, melt 2 tablespoons butter. Pour melted butter into the bowl with the bread; toss. Set the bread crumbs aside. Warm milk in a saucepan over medium heat. Melt remaining butter in a high-sided skillet over medium heat. When butter bubbles, add flour. Cook, stirring for 1 minute. While whisking, add hot milk a little at a time to keep mixture smooth. Continue cooking, whisking constantly, until mixture bubbles and thickens, 8 to 12 minutes. Remove pan from heat. Stir in salt, nutmeg, both peppers, 3 cups cheddar and all of the gruyere. Stir and allow to cool slightly. Place egg yolk in a bowl and add one spoonful of cheese mixture and whisk until well blended. Add egg mixture to remaining cheese mixture and stir until well combined. Cover a large pot of salted water, and bring to a boil. Cook macaroni for 2 to 3 minutes (the macaroni will continue cooking in the oven). Drain and run under cold water. Add macaroni to cheese mixture and combine. Pour mixture into prepared baking dish and spread until even. Sprinkle remaining cheddar cheese and reserved bread crumbs over top. Bake until golden brown, about 30 minutes. Serve and enjoy! 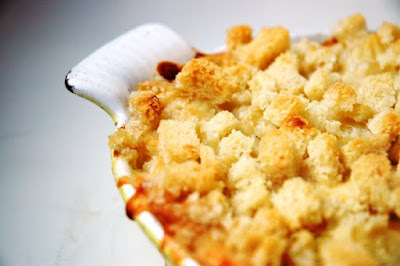 Looks fab & love the breadcrumb topping! Whoa, looks great! Perfect cold weather dish. Thanks everyone! You’re right Jessie, this is perfect for a cold evening! I think the crispy bread crumbs on top of mac & cheese is the best part. I like that yours has so much on top! OMG Marc, I totally agree…the crumb is the best part! I like this recipie ! That looks nice and cheesy and good! Thanks Satria, Amalia, and Kevin! That Martha Stewart sure knows what she’s doing! Yum! I love a good mac and cheese recipe – this one looks great! I am inspired to hit the kitchen and make some! What is gruyere cheese? Sounds interesting, looks great! For some reason, the mac and cheese in restaurants they serve in those shallow ceramic dishes always taste better (like in your picture). Cook Macaroni for 2-3 Minutes??? Um Martha Stewart doesn't say to do that. She says to cook it 2-3 minutes FEWER than what the box says. Also, she doesn't have EGG in her recipe. BEWARE!!! Thanks for the link Mark…..I never claimed that this was the original Martha Stewart recipe, I only said it was BASED on her recipe. Thanks for the link to the original though. Made this one on a special occasion for my significant other. Man, was he happy! Even I was pretty impressed with the way it came out. I halved the recipe and cooked the macaroni a little longer than you suggested and it didn't seem to make a difference. The sauce sure made for creamy goodness. Plenty for two with some leftovers. You know, if *I* took a picture of dried-up drippings on the side of my pan, it would look disgusting. Somehow, this is the opposite. Unfair. Made this for my two best girl friends…we are all from the south! And all of us said, this was THE BEST mac and cheese recipe we've ever had. I paired it with grilled pork chops and a nice light salad. Wish I could post some photos…they are spectacular! This mac & cheese is delicious, pure comfort food. I've made it twice and have just added the ingredients to my shopping list. 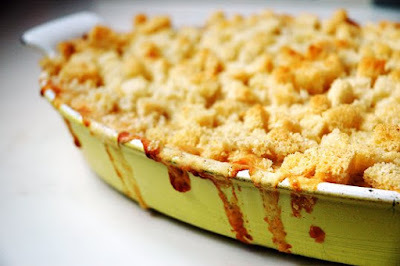 I added around a cup of mashed butternut squash to the sauce, and used gluten-free noodles, flour and bread crumbs. The cheese sauce is amazingly creamy. This freezes well too – I have frozen both large containers and lunch-sized containers. I think the keys to success are the significantly under-cooked macaroni and the egg yolk, precisely the differences from Martha Stewart's recipe. I have both cheeses in my fridge so this recipe is calling me! Serving 2 mac and cheese lovers in my family. Yum.